Lastly then is the crystal case. Crystal Cases, as the name suggests are crystal clear clip on covers that are designed to protect the housing of your device from scratches and absorb impact damage when you drop it. Now, crystal cases aren’t the most robust case you can get, if anything they’re probably the weakest case available, but if you drop your iPod and the case breaks, then it’s done it’s job properly – after all, I’m sure that you wouldn’t want your iPod to break and your case be intact. They’re one of the most affordable cases available which makes them extremely popular. So that’s my top ten for the iPod touch 2G – It’s not all of the cases available, just our most popular ones. 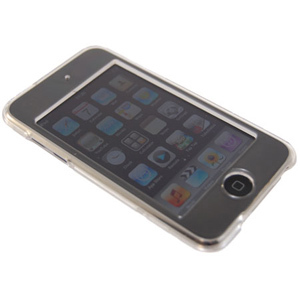 If you haven’t seen a case here that does what you want, then take a look at our full range of iPod touch 2G cases. If you’ve seen a case that you think should be in our Top 10, let us know by leaving a comment below.